In December 2010, Starbucks officially started an initiative to build all new company owned stores toward the eventual goal of beingLEED certified. A mighty announcement for such a behemoth of a company -- with 17,000 stores world-wide and growing -- but the plan seems to be going as laid out. 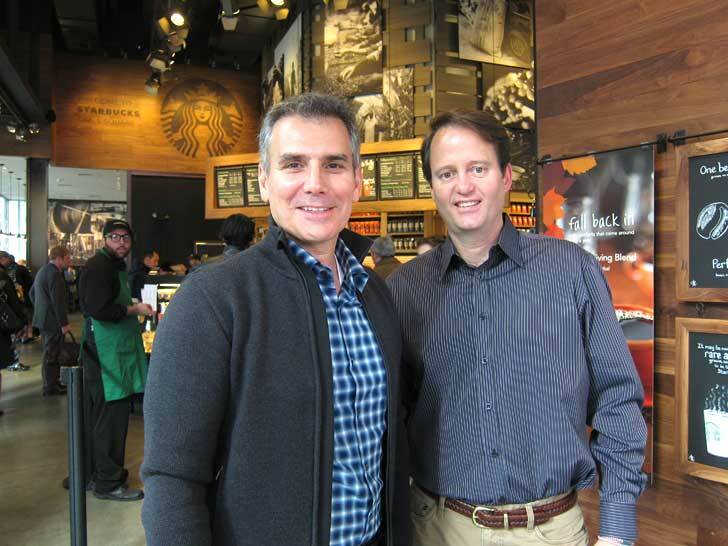 We sat down with Arthur Rubinfeld, President of Global Development, and Ben Packard, Vice President of Global Responsibility, on the day Rubinfeld was to recieve a Global Green Sustainability Design Award for Green Building Design thanks to his work in building LEED certified Starbucks. The newly sustainably remodeled Times Square store was our venue with recycled concrete, repurposed wood and a vintage coffee sign as our backdrop and the topic of conversation was how you get a global brand to successfully and transparently go green. It seems that having the leadership of a sustainably focused architect -- Rubinfeld -- and a 20-year veteran of the environmental management field -- Packard -- helps. INHABITAT: When did you start the program to build all new Starbucks locations to LEED certified standards? Arthur: We officially launched it in 2008. The company has a history of innovation in this area, of environmentalism and sustainability, and it was, in a very interesting way, seamless to the company’s mission statement of environmentalism, in that we have a “shared planet platform.” That’s what we named it, and it has three parts. The C.A.F.E. practices [C.A.F.E. stands for Coffee and Farmer Equity], which deals with how we work with the farmers in the origin countries, in terms of quality of yield and working with them to produce the finest beans in the world, what we do for their education system, for their quality of life in general, water supply, you name it. The second one is community involvement. We’ve announced that we are heading towards a million hours of all of our employees community involvement time. The third is environmentalism; it was sort of seamless to say this is an opportunity for us to use our global outreach and for all company owned stores to be designed and built to LEED certifiable standards. INHABITAT: How many LEED certified stores do you have so far? Arthur: Getting the certification takes time, but I would say we have well over 200 at this time. To be clear, every company owned store from the moment the site is selected is looked through a lens to be designed and built with sustainable methodology in order to obtain the level of LEED certification. We try to shoot for the highest levels, but depending on the country and where we are at, there are nuances. We don’t control the entire process because we’re leasing space, this is a big point of differentiation. It isn’t like we are building from scratch. We are actually leasing space in another location, a certain biosphere that is under the control of a landlord. The beauty of it is we’re educating landlords and real estate people worldwide in what leading energy and environmental design initiatives could be. Ben: We actually started this conversation and joined the USGBC in the year 2000. Basically, LEED was designed with office buildings in mind. So the application of LEED to retail wasn’t an easy one. We chaired the retail development committee and helped the USGBC create LEED for retail, and now we are taking it to scale not only by applying it as Arthur said on leased spaces by using the [LEED] Commercial Interiors and the [LEED for] New Construction, but also then applying it across the portfolio. No other company is taking it to scale like we are by applying it in all those stores. INHABITAT: How does building to LEED standards affect the bottom line of Starbucks and the bottom line of the stores built? Arthur: I think it takes a great amount of leadership and consistency of delivering the message and driving it and driving it and driving it. A lot of people think immediately, “Oh, that costs much, much more.” In the beginning, we could never quantify the return on the investment, but we had a good feeling that the return on investment would occur over the lease length. We generally rent spaces up to ten years with options. What we’ve been finding over the few years is, saving in energy in addition to what we’re doing in water savings and attention to detail for energy conservation is actually giving us the returns that we had hoped for. We are making believers out of people who don’t focus on this area at all in their lives, and we are touching so many people, whether it be contractors or people that are trying to understand what it all means. One of the more evident areas is when we reuse recycled materials such as wood and tables. And we highlight it with live edge, high texture, high touch. So on the end of the main bar [in Times Square], one of our unique details is live edge countertops. What that does is people start to use tactile means to understand that something else is happening here, and it just raises their level of interest. It is beautiful, and we’re actually able to find these small upstart craftsman who love working with their hands for metal, for woods, and recycled materials. These are cottage industries that are doing quite a business with us, and we highlight it. INHABITAT: How do you find local craftsmen in the local communities? What’s it like working with them? Arthur: To us it is exciting, it adds layers of complexity. We have a unique footprint globally. We probably have one of the world’s largest design/build/management firms in retail globally. We have offices all over the world that have designers in them. It is very unique. Usually, corporations have architectural firms working for them, and they send out drawings or they are in a country working with a central office. We have people like us in many offices, worldwide, that are all coming from the same mission statement. INHABITAT: So you are building the stores with internal designers? Arthur: The architects and designers are internal, yes. An added layer for us is being locally relevant. Not just socially locally relevant, in terms of contributing back to communities where we do business, but local relevance in terms of the store’s interior and what it means for a New Yorker as opposed to someone in Tokyo. How do you make that place feel welcoming and comfortable as a community gathering place? INHABITAT: As a global corporation you are working with farmers in really remote areas. How do you make sure that those farms are ethically run, the people are treated well, and the coffee is high quality? Ben: So the C.A.F.E. practices piece is something that we developed with Conservation International. Essentially it is a buying standard. So there are a couple of prerequisites, similar to LEED. We’ve got perquisites around equality and transparency to the farmer. Not to the co-op, but actually how much is the farmer getting paid. If a organization, co-op or a farm meets our equality standards and can provide transparency, then we’re in a conversation about potentially buying their coffee. The premise of this whole specialty coffee industry is around quality, so this program really embeds that into it. Arthur: Imagine driving down a dirt lane in Costa Rica or Guatemala, and on the right hand side are coffee trees and plants, and on the left hand side is the same. But on one side, the yield on the trees during season is ten times more rich with coffee cherries. Because of the practices that Ben just talked about, we have farmer support centers working with farmers to identify the strongest seedlings, the best environmental practices for tending and caring for the plants during their formative years, pruning, harvesting techniques over time. I saw it with my own eyes, it is unbelievable, the farmers that work with us are seeing up to ten times the yield on a plant. And it goes back to those initial C.A.F.E. practices and our initiatives that we get as many farmers as possible to follow. They make more money, better education, and better quality of life for their families. Ben: In addition to having standards that have perquisites around quality, there’s also zero tolerance issues around social welfare of the people working on the farms, as well as zero tolerance around environmental issues. All of this stuff is online, it is all open source, and we’ve actually seen other farmers using it. That’s kind of the purpose of it. From a development standpoint it isn’t just about making sure the customer knows that the quality of the coffee and how the people are treated. But also if we are improving their yield and we are providing them technical support and potentially lending them money, that is a much more long term impact on that community than a single year buying to any given standard. We’re building the resiliency of these communities. INHABITAT: When did you start the program to build all new Starbucks locations to LEED certified standards? Arthur: We officially launched it in 2008. The company has a history of innovation in this area, of environmentalism and sustainability, and it was, in a very interesting way, seamless to the company's mission statement of environmentalism, in that we have a "shared planet platform." That's what we named it, and it has three parts. The C.A.F.E. practices [C.A.F.E. stands for Coffee and Farmer Equity], which deals with how we work with the farmers in the origin countries, in terms of quality of yield and working with them to produce the finest beans in the world, what we do for their education system, for their quality of life in general, water supply, you name it. Arthur: The second one is community involvement. We've announced that we are heading towards a million hours of all of our employees community involvement time. The third is environmentalism; it was sort of seamless to say this is an opportunity for us to use our global outreach and for all company owned stores to be designed and built to LEED certifiable standards. Arthur: Getting the certification takes time, but I would say we have well over 200 at this time. To be clear, every company owned store from the moment the site is selected is looked through a lens to be designed and built with sustainable methodology in order to obtain the level of LEED certification. We try to shoot for the highest levels, but depending on the country and where we are at, there are nuances. We don't control the entire process because we're leasing space, this is a big point of differentiation. It isn't like we are building from scratch. We are actually leasing space in another location, a certain biosphere that is under the control of a landlord. The beauty of it is we're educating landlords and real estate people worldwide in what leading energy and environmental design initiatives could be. Ben: We actually started this conversation and joined the USGBC in the year 2000. Basically, LEED was designed with office buildings in mind. So the application of LEED to retail wasn't an easy one. We chaired the retail development committee and helped the USGBC create LEED for retail, and now we are taking it to scale not only by applying it as Arthur said on leased spaces by using the [LEED] Commercial Interiors and the [LEED for] New Construction, but also then applying it across the portfolio. No other company is taking it to scale like we are by applying it in all those stores. Arthur: I think it takes a great amount of leadership and consistency of delivering the message and driving it and driving it and driving it. A lot of people think immediately, "Oh, that costs much, much more." In the beginning, we could never quantify the return on the investment, but we had a good feeling that the return on investment would occur over the lease length. We generally rent spaces up to ten years with options. What we've been finding over the few years is, saving in energy in addition to what we're doing in water savings and attention to detail for energy conservation is actually giving us the returns that we had hoped for. Arthur: We are making believers out of people who don't focus on this area at all in their lives and we are touching so many people. Whether it be contractors or people that are trying to understand what it all means, cause it is a little confusing. You'll notice plaques around certain stores. We worked to detail about 20 different plaques and we strategically locate them without screaming to people. If they have an interest they read it they learn about waste diversion and that 80%-90% of demolition materials are adaptively reused. Arthur: One of the more evident areas is when we reuse recycled materials such as wood and tables. And we highlight it with live edge, high texture, high touch. So on the end of the main bar [in Times Square], one of our unique details is live edge countertops. What that does is people start to use tactile means to understand that something else is happening here, and it just raises their level of interest. It is beautiful, and we're actually able to find these small upstart craftsman who love working with their hands for metal, for woods, and recycled materials. These are cottage industries that are doing quite a business with us, and we highlight it. INHABITAT: How do you find local craftsmen in the local communities? What's it like working with them? Arthur: To us it is exciting, it adds layers of complexity. We have a unique footprint globally. We probably have one of the world's largest design/build/management firms in retail globally. We have offices all over the world that have designers in them. It is very unique. Usually, corporations have architectural firms working for them, and they send out drawings or they are in a country working with a central office. We have people like us in many offices, worldwide, that are all coming from the same mission statement. Arthur: The architects and designers are internal, yes. An added layer for us is being locally relevant. Not just socially locally relevant, in terms of contributing back to communities where we do business, but local relevance in terms of the store's interior and what it means for a New Yorker as opposed to someone in Tokyo. How do you make that place feel welcoming and comfortable as a community gathering place? Ben: So the C.A.F.E. practices piece is something that we developed with Conservation International. Essentially it is a buying standard. So there are a couple of prerequisites, similar to LEED. We've got perquisites around equality and transparency to the farmer. Not to the co-op, but actually how much is the farmer getting paid. If a organization, co-op or a farm meets our equality standards and can provide transparency, then we're in a conversation about potentially buying their coffee. The premise of this whole specialty coffee industry is around quality, so this program really embeds that into it. Ben: In addition to having standards that have perquisites around quality, there's also zero tolerance issues around social welfare of the people working on the farms, as well as zero tolerance around environmental issues. All of this stuff is online, it is all open source, and we've actually seen other farmers using it. That's kind of the purpose of it. Ben: From a development standpoint it isn't just about making sure the customer knows that the quality of the coffee and how the people are treated. But also if we are improving their yield and we are providing them technical support and potentially lending them money, that is a much more long term impact on that community than a single year buying to any given standard. We're building the resiliency of these communities.